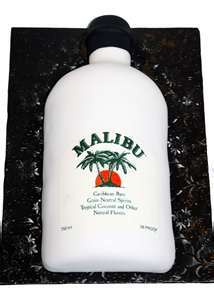 Malibu Rum is a rum made in Barbados with natural coconut extract. The alcohol content by volume is 21.0% (42 proof). The brand is owned by Pernod Ricard. The product was originally made from fruit spirits, flavored with rum and coconut flavoring in Curaçao. Originally, the product was used to simplify the making of Piña Coladas by bartenders. When the product took off production was then moved to Jamaica, and the quality of the ingredients used were improved. The brand was sold by Diageo to Allied Domecq for £560m ($800m) in 2002 and later to Pernod Ricard. The first variation of the rum was Malibu Lime which was only sold in Jamaica and night clubs in France. Despite having some success in Jamaica, it did not take off in France and was discontinued in July 2003. Currently on the market there are variations on the original flavour, such as Malibu Mango Rum, Malibu Passion Fruit Rum, Malibu Pineapple Rum, Malibu Tropical Banana Rum and recently Malibu Island Melon Rum. Malibu and its variations can be drunk neat, on the rocks, with milk, or more commonly, with a fruit-based mixer or a carbonated soft drink such as Coca Cola or Pub Squash, in which case the drink is renamed Jamaican Lemonade. Malibu Coconut is mixed with pineapple juice and Bacardi 151 to make a Caribou Lou. A Surfer on Acid is made using equal parts of Jägermeister, Malibu Rum, and pineapple juice. Although the bottle for the coconut-flavored rum is opaque white, the drink is colourless and slightly more viscous than regular rum.